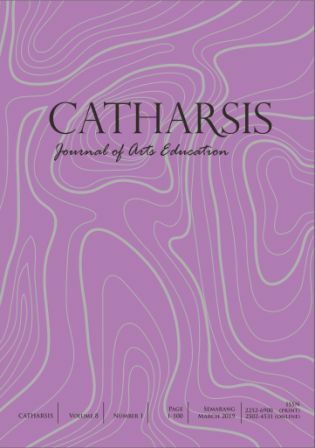 Catharsis: Journal of Arts Education provides an international forum for research in the field of the art and creative education. It is the primary source for the dissemination of independently refereed articles about the visual arts, performances (music, dance, drama/theater/play), creative process, crafts, design, and art history, in all aspects, phases and types of education contexts and learning situations (formal and informal). Research, comprises scholarly reports that enhance knowledge regarding art in general, performing art, and art education. This may include articles that report results of quantitative or qualitative research studies. Conceptual Idea, publishes articles conceptually relevant to advancing the practice of art and learning, present theories of art, models, or philosophical position, etc. Articles may draw upon theory/or material developed in educational practice that recognize and address a wide range of pedagogical approach that would interest members from a variety of countries and teaching setting, including activities and art materials to help internationalize art curricula. The research article submitted to this online journal will be peer-reviewed at least 2 (two) reviewers. The accepted research articles will be available online following the journal peer-reviewing process. Language used in this journal is English. Articles must be original and not yet published in any journals.